I had just alighted from the Shatabdi Express, having arrived from Kalaburagi (Gulbarga). I tried getting a cab/auto on the Ola app, to head to Shivajinagar bus station - but none turned up. I hired an auto from the railway station, making my wallet lighter by about Rs. 100. 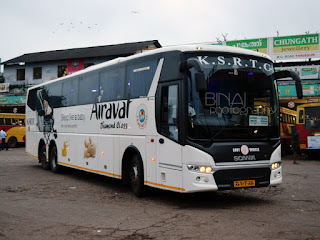 As I traveled towards the bus station, shivering in the cold, I checked on the internet if there were any buses to Shirdi that I could reserve on. I found none, and decided to try my luck at the MSRTC bus station. I felt uneasy as I neared the bus station - the entire area was crowded and chocked. I understood that getting a bus wouldn't be easy. The bus station was packed to capacity - It was impossible even to get to the enquiry counter! 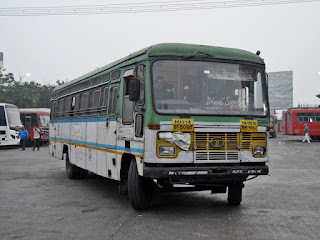 The MSRTC website claimed there were buses at 0000 and 0100hrs - but I had no clue if they'd arrive, and I was fairly sure it would be impossible to get into them, in any case. I looked at 'Plan-B' - taking a bus to Nashik. I headed to the platform from where they leave - only to be greeted by a long queue there as well! I managed to get to the enquiry counter there, who said the last scheduled bus was at 0030hrs, but they'd send additional buses to meet the demand. I decided to join the queue - the queue moves only when a bus is lined up for departure, and the buses were leaving at a 30 minute interval! The queue was long, really long - I was sure I'd not be able to get unless they sent atleast 2 extra buses. The queue moved slowly - they closed the departure counter around 0100hrs - while I was still about a "bus length" away in the queue! The officials said they couldn't operate additional buses anymore, and closed the counter. I had to look at alternative options now. 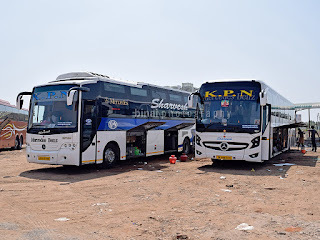 I fired up the MSRTC online reservation website, and found a bus to Shirdi with a scheduled departure time of 0300hrs - I didn't want to take anymore risks, and quickly tried booking a ticket. The bus had just three seats left, and the payment failed twice. The number of available seats dropped down to 1 now, and I got a little panicky. The payment went through at the third attempt - and I got seat #40 in a 'Hirkani' (Semi-Luxury) bus heading to Malegaon. This bus had a scheduled arrival time of 0815hrs at Shirdi, due to which I had not picked this bus earlier. I had a darshan time of 0930hrs at the temple, and this bus could cut very close. I didn't have an option now - perhaps I was destined to travel by this bus! I had close to two hours to spend now - I had donned winter wear by now. I was quite hungry as well. I managed to stay awake - walking up and down the bus station aimlessly, and sitting for a while at the bus station as well. Finally, I couldn't bear my hunger anymore, and walked into the dim lit and drab looking canteen present at the bus station. They didn't have a lot of options - managed to grab a quick bite. While I was busy chomping down my bite, an announcement about my bus was made on the PA system. A white-and-green coloured bus, MH-14-BT-5068, built on a Tata Chassis at Central workshop Dapodi (Pune), and homed at Malegaon depot, was parked at the platform, with the board "Pune Malegaon" - a very dull bulb lit the board. People were mobbing the bus, and barged in like a war field. I wanted to confirm that the bus was correct, and quickly checked with the enquiry counter. They confirmed that I was looking at the correct bus. I returned to the bus, struggled, found some space and entered into the bus. I had to search for my seat now - going by convention, seat #40 should be at the back, but MSRTC's seat chart said it at the front. I asked the driver where this seat was - he quickly replied, this bus has only 34 seats! What? Are you kidding me? I rushed out of the bus, headed to the enquiry counter. The guys at the enquiry counter seemed bemused - they said I need to wait for the conductor who would re-allot a seat for me. I was a little upset - what if the bus was full? I had no option, but wait. 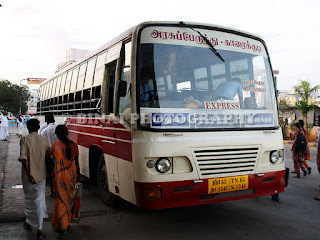 While waiting, a couple of guys headed to the enquiry counter to complain about the bus - their claim was that they had reserved in a "semi-luxury" bus and an ordinary bus was parked there - the guy at the enquiry counter smiled and replied, that is a semi-luxury bus, although it looked ordinary! The guys were confused - but walked back to the bus. The conductor turned up at about 0245hrs - he already appeared harried. He got into the bus and announced that the bus was fully reserved (what?) - he asked all unreserved passengers to alight from the bus. Some people were adamant not to alight - he warned them that they'd have to travel standing. Soon, he started re-allotting seats. I was given seat #11 - a window seat in the third row. He continued re-allotments - he could do that since the bus had a few seats marked for "VIP" quota. The melee inside the bus settled as he finished re-allotments. He quickly checked and confirmed that the other reserved passengers were on board, and the accepted a few standing passengers. There was a minor scuffle as some lady passengers argued that they be allowed to sit on seats earmarked for ladies - but the conductor was helpless since the bus was overbooked. The bus backed out of the departure bay at 0304hrs - about 4 minutes behind schedule. The driver was ballistic from the beginning - he literally gunned down the empty streets of Pune. We picked up passengers from Kasarwadi (0322hrs) and Bhosari (0328hrs), and continued towards Sangamner. The conductor had checked all the tickets now, and update the new seat numbers on his reservation chart as well. I was tired - very badly! I hadn't slept - and it was almost morning already! I had covered myself in winter wear, and it was really cold - the windows in the bus weren't closing tight either, to make matters worse. The winter wear helped me, and I pulled over a cap over my eyes to help me sleep. I slept quite well - really well. I didn't realise the stops the bus made on the way. I did realise a few rough patches that the bus went through - I woke up just as the bus parked at Sangamner bus station (0550hrs) - we were about 40 minutes before scheduled time. I was sure of a before time arrival at Shirdi, and wanted to remain awake for the rest of the distance. We started off again at 0556 hrs - and as expected, I fell asleep soon after we started. I was terribly tired! I remember seeing the bus stopped at Babhaleshwar - I didn't note the time though, rather, I didn't have the energy to note the time. I slept for a while more, and woke up as we passed Rahuri. The conductor was already calling out for passengers alighting at Shirdi. The driver was still on the accelerator pedal, hard, and we were still flying. The bus pulled into Shirdi bus station at 0705hrs - about an hour and 10 minutes before scheduled time - and just 4 hours and a minute since we started from Pune, covering a distance of over 190 kilometres! Remarks: The bus, MH-14-BT-5068, homed at Malegaon depot (Nashik Division) was built on a Tata 1512 Chassis, by Central Workshop Dapodi (Pune). The bus was basic - had push back seats, claimed to have air suspension on the rear axle, rattled like crazy, had dim lights, with windows that wouldn't shut close. The crew were great - the conductor did his job perfectly without shouting or getting angry. The driver was ballistic - literally flew through the distance. The journey was quick, and got me to Shirdi more than an hour early, thereby giving me ample time to relax, and even take a quick nap, before I headed to the temple. Overall a journey that I loved a lot. I'd surely love to ride in an MSRTC again!